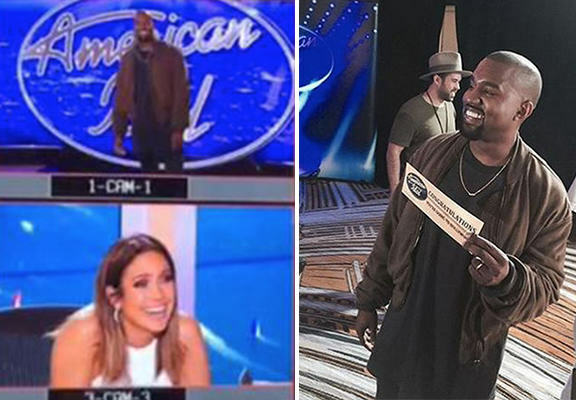 The judges of American Idol have probably seen some crazy and shocking moments in their time, but they definitely weren’t expecting none other than Kanye West to stroll through the door during this season’s auditions. The 38-year-old decided to have a bit of fun (remarkably, he even cracked a smile) and left Jennifer Lopez struggling to regain her composure after surprising her and her fellow judges, Harry Connick, Jr. and Keith Urban. Kanye impressed the judges with a performance of his song ‘Gold Digger’ and, it’s clear from the snaps uploaded to Twitter by his wife Kim Kardashian, that J Lo in particular could barely believe her eyes when Kanye appeared. A short clip uploaded to social media shows part of Kanye’s surprise performance in San Francisco. The judges were so impressed with Yeezy’s rendition of his own song, they even gave him a golden ticket to Hollywood’s final show! And, judging by host Ryan Seacrest’s behind-the-scenes Instagram photo, Kanye was very excited to be going on to the next round.